Motorists were being diverted from Hamilton Avenue and traffic was backed up to state Highway 17, authorities said. The intersection of Hamilton and Leigh avenues in Campbell was closed as police investigated a crash, Thursday, Feb. 25, 2016. 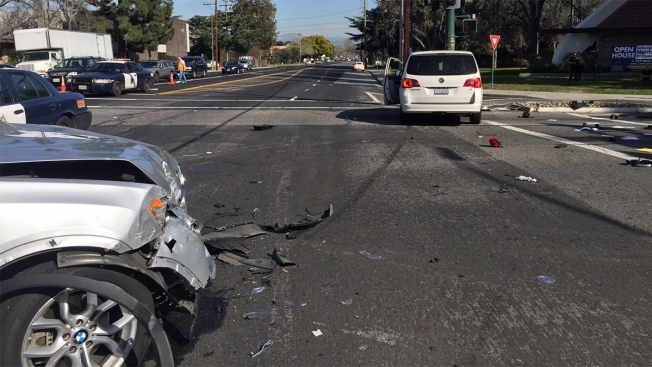 Traffic was backed up for hours after a motorcyclist was injured in a collision involving three cars in Campbell Thursday afternoon, a police spokesman said. The accident happened shortly after 2 p.m. at the intersection of Hamilton and Leigh avenues, police Capt. Gary Berg said. The motorcyclist suffered major injuries and was transported to a nearby hospital, Berg said. One of the drivers complained of pain and was treated at the scene then released, according to Berg. The vehicles involved in the collision sustained moderate to major damage, he said. Motorists were being diverted from Hamilton Avenue west of Leigh Avenue and traffic is backed up to state Highway 17, Berg said. The intersection remains closed and is estimated to reopen between 5:30 p.m. and 6:30 p.m., he said.